Each year, contaminated food sends an estimated 128,000 victims to the hospital, and it kills some 3,000 children and adults. 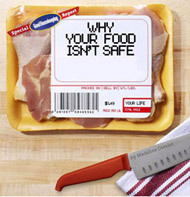 In her investigative article “Why Your Food Isn’t Safe,” Schuster Institute for Investigative Journalism Senior Fellow Madeline Drexler teamed with Good Housekeeping magazine and investigated and carefully detailed serious lapses and failures in U.S. food safety policies and practices. In her investigation, Drexler points to specific actions government agencies should take to reduce the frequency and severity of serious, sometimes deadly, foodborne illness outbreaks. She also offers steps consumers can take to protect themselves from foods bought in grocery stores, farm markets, and restaurants. Immediately after the article became public, two federal agencies responsible for different aspects of food safety announced positive changes recommended in Drexler's article that will better protect the consumer. The United States Department of Agriculture (USDA) announced on Monday, September 12, 2011, that it is extending the ban on E.coli in ground beef to include six toxic strains. Two days later, the Food and Drug Administration (FDA) addressed another of the article's suggestions and announced on Wednesday, September 14, 2011, that it is establishing a foodborne illness outbreak response network. 1 in 6 Americans–get sick from something they ate. Contaminated food causes sends 128,000 victims to the hospital. And it kills 3,000 children and adults. Public health officials identify some 1,000 disease outbreaks annually–but these documented epidemics don’t suggest the full scope of the problem. According to the U.S. Centers for Disease Control and Prevention (CDC), the vast majority of reported cases of foodborne illness crop up as individual or "sporadic" cases–but may be actually part of unrecognized widespread or diffuse foodborne illness outbreaks. While the total numbers represent a drop from 1999 (when the last big government report on foodborne illness was published), the decline has not been as sharp in recent years. Data from CDC’s surveillance program FoodNet show that most of the decrease in illness took place between 1996 and 2000, with little improvement since then (see p.890). E. coli in ground beef. This spring, an emerging strain of E. coli in raw sprouts–dubbed O104:H4–killed more than 50 people in Germany and France (including a U.S. traveler) and sickened thousands–one of the most dramatic food-related epidemics on record. Earlier this year, we saw signs of progress. In January, President Barack Obama signed the landmark Food Safety Modernization Act (FSMA), the largest expansion of the FDA’s food safety authorities since the 1930s. But the new law never received funding from Congress–in effect, making it irrelevant. That kind of one-step-forward, two-steps-back approach frustrates food safety advocates–many of whom have seen loved ones succumb to preventable foodborne infections. “Sometime I just shake my head at how long we’ve been fighting this fight,” says Nancy Donley, President of STOP Foodborne Illness, an organization she founded in 1993 after her six-year-old son and only child, Alex, died after eating an E.coli-contaminated hamburger at a family cookout. Unless otherwise noted, all content about foodborne illness and food safety policy is written by Madeline Drexler, Schuster Institute senior fellow. Copyright © 2011 Schuster Institute for Investigative Journalism at Brandeis University, Waltham, MA.